Hibs midfielder John McGinn and Hearts goalkeeper Jack Hamilton will miss Scotland’s World Cup qualifier against England after Gordon Strachan trimmed five players from his squad. 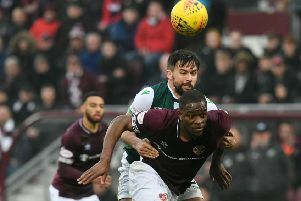 Championship player of the year McGinn and Tynecastle stopper Hamilton were named in the original 29-man pool for the match at Hampden a week on Saturday. But the duo have now been told they are surplus to requirements after Strachan cut his squad for the “must-win” match to 24. Former Hibs striker Steven Fletcher, Aberdeen midfielder Kenny McLean and Brighton’s Jamie Murphy are the other players to drop out. New Hearts skipper Christophe Berra remains in the squad. Goalkeepers: Craig Gordon (Celtic), David Marshall (Hull City), Allan McGregor (Hull City); Defenders: Ikechi Anya (Derby County), Christophe Berra (Hearts), Stephen Kingsley (Swansea City), Russell Martin (Norwich City), Charlie Mulgrew (Blackburn Rovers), Mark Reynolds (Aberdeen), Andrew Robertson (Hull City), Kieran Tierney (Celtic); Midfielders: Stuart Armstrong (Celtic), Barry Bannan (Sheffield Wednesday), Scott Brown (Celtic), Tom Cairney (Fulham), Darren Fletcher (West Bromwich Albion), Ryan Fraser (Bournemouth), James Forrest (Celtic), James McArthur (Crystal Palace), James Morrison (West Bromwich Albion), Robert Snodgrass (West Ham United). Forwards: Leigh Griffiths (Celtic), Chris Martin (Derby County), Steven Naismith (Norwich City).